Map of the overall Area of Operations (AO) for Operation Pegasus. Click to see larger version. The map is quite large - have patience while it downloads. Map courtesy Shelby Stanton, Anatomy of a Division. 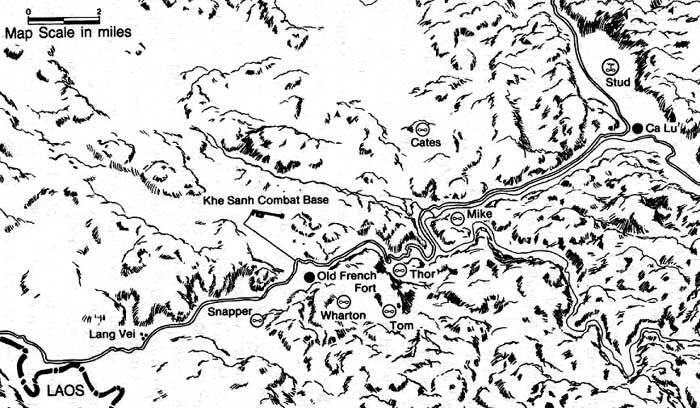 On April 1st, C 2/5 Cav is working on the north side of the Song Thac Ma, the boundary river between Quang Tri and Thua Thien provinces. The next day, the company moves to an open field two and one half kilometers southwest of the Hai Lang District Headquarters for provisioning. At 8:26 AM on April 3rd, C 2/5 Cav is airlifted from extreme southern Quang Tri Province to LZ Stud, a big logistics base in the north of the province built for Operation Pegasus by Navy Seabees and units of the 8th Engineer Battalion, 1st Cavalry Division. Immediately after landing, the company CA'd to LZ Tom. This is actual footage of Charlie Company. It was shot by Ken Burington on an 8mm movie camera. There is no sound. While the quality of the original video is better than expected, it will be of poor quality if you view it over a dial-up connection. Click here to watch the video. You will need the free RealPlayer plug in. April 1 - C 2/5 mortar crew during an actual fire mission near the Song Ma (the river that is the boundary between Thua Thien Province and Quang Tri Province, on Highway Nine. LZ Stud, including a shot of Major General Tolson, then the Commanding General of the 1st Cavalry Division (Airmobile). It is assumed that the Lieutenant Colonel he is talking to is the 2/5 Cav commander. Anyone know for sure? LZ Stud. Takeoff on the combat assault to LZ Tom. LZ Tom at XD900345, Map 6342-2. This was to become the 2nd Brigade base, but it was secured by C 2/5 Cav. There is also a shot of a huge Sikorsky Skycrane helicopter that was used to lift very heavy loads. LZ Tom - a Chinook helicopter with a 105 mm howitzer slung underneath. LZ Tom - 2nd Platoon clearing elephant grass. LZ Tom - a Chinook helicopter landing a quad .50 machine gun. Note the soldier jumping clear as the sling is released. LZ Tom - cutting trees for building bunkers. 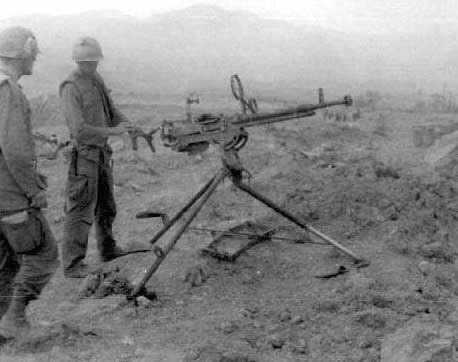 SGT Dan Meddling of Tennessee is standing next to a captured enemy .51 caliber machine gun at the Old French Fort (see map above). Trooper far left is unidentified. 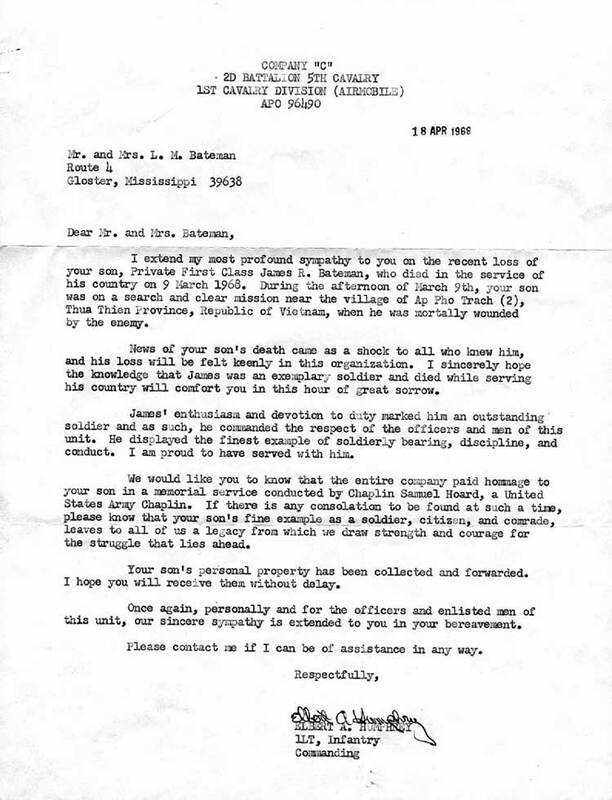 Though busy with other combat duties, this letter of condolence was written by the company commander, 1LT Burt Humphrey, to the family of PFC James Bateman who was KIA on March 9.